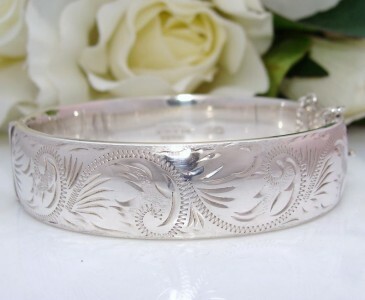 Rarely do I offer Sterling Silver as it is difficult to source it Fabulous condition! This one ticks all the boxes – quite Wide, Thick, Quality Made and Absolutely Beautiful. It is a Quality-made English piece diamond cut with a stylized Victorian-style scrolling foliate design to the front while the back is plain and smooth. The clasp is a tongue & box mechanism with a safety chain to protect against loss. The hinge has a tightness that comes from having rarely been opened – confirmation of little use. It has that lovely, highly polished, silky smooth sheen expected of quality vintage jewellery. Weight: a hefty 27.2 grams! Near MINT Vintage condition! There are no dents, damage or repairs evident and just a bare hint of scratching consistent with a little use. The finish is Pristine & it is just fabulous on the wrist - you will be thrilled with this purchase, Guaranteed! It will suit the most fastidious of purchaser.